Under Southern Natal of the KwaZulu Natal Province, our Centre has sub-centres at Chatsworth, Phoenix, Pietermaritzburg, and Satsang groups in Redhill, Durban Central, Etete, Sydenham, Tongaat and Verulam. 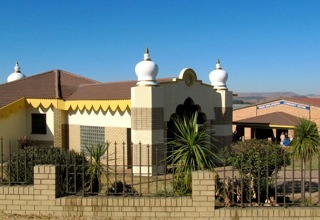 Northern Natal covers sub-centres at Ladysmith, Newcastle and Dundee and Satsang groups at Glencoe and Estcourt. Truly speaking, all the devotees have the same thread of bhakti to the Holy Trio connecting everyone wherever they are. In this respect, the place one hails from has no importance. The Ramakrishna Centre has brought wonderful unity among all the branches by infusing a definite pattern of conducting satsangs, introducing dress code for men and women, inculcating committee-based administration and other levels of running the branches. The devotees from Southern Natal actually have very many opportunities to meet me as most of them frequent our HQ at Glen Anil. They regularly attend almost all celebrations here. Not so with the devotees of the Northern Natal centres: I only meet them three or four times in a year. This year Estcourt became an exception to the above rule! In one month i.e., in October, I paid two visits within eleven days! Incredible! The first visit was on October 12 during the Navaratri celebration, and the second one was on October 24 at the Community Diwali Festival. 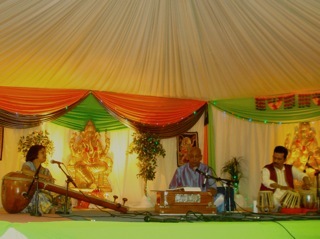 Both these events were well attended by the prominent Hindu public of Estcourt. The second visit, by Master’s grace, to Estcourt, was to take part in the Diwali festival. 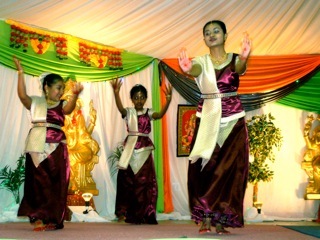 This was organised by the Estcourt Hindu Community in general. On that very morning I had to conduct the Gospel class at REGA Temple (Redhill) – where it went off well. Yash picked me up from the Temple and we proceeded directly to Pietermaritzburg in his car. All through the one hour drive the rains were torrential. The sun came out the moment we reached the home of the Chairman of the PMB Sub-centre! After having refreshing tea we, together with a few other devotees, left for Estcourt, to the home of the Esctcourt satsang group Chairman. This was followed by a sumptuous lunch and a brief but welcome rest. The devotees of our Estcourt branch had collected there and met me. There is nothing like enjoying Diwali on the very Diwali night. How many millions of people are celebrating it! What plays in collective consciousness has a definite impact on the individual mind. Functions like Diwali are celebrated in families, societies; also at national and world level. So to desire the same amount of delight at a small community group level and that too not on the Diwali night but a few days earlier, may seem to be impossible to many. But not for me! At exactly 4 pm, the Diwali function began with the ‘spiritual darlings’ (devotees’ children) leading me into the spacious Swami Sahajananda Community Centre hall. A traditional welcome was accorded to me. This was followed by fascinating items like bhajans, kirtans and then by captivating dances on the Divine Mother by children and adults separately. 1 – Pride in one’s glorious past, 2 – Diwali legends and 3 – Lighting the lamp of knowledge within. After supper, the organizers lovingly invited me to witness the grand display of man-made fireworks. It was held on the opposite vacant grounds. The clouds had gone away. Pleasant dark sky was all that we could see. This time a rain without clouds! The burst of crackers and rockets, serially one after another, brought forth a rain of sparkles. Oh! what a riot of colours! To the delight of more than 400 crowded people, for a few moments the sky became luminous thus appearing to me the cosmic shakti caught the stars and held them near for us! Oh! twinkling little stars! How I wonder what you are!! My salutations at the feet of Master, Holy Mother, Swamiji and revered Maharaj. I cannot but agree with you on how Master has spun his love and grace around the devotees of South Africa. The love and bhakti that emanate from them inspire an aspiring devotee to surrender more to the Master. The Diwali satsang at headquarters was also truly blessed by the holy trio and your divine message. Indeed you just seem to echo the valuable words of New Delhi Swamiji (Shantatmanandaji). Only the other day he, during his tele-talks, was conveying to me his admiration for the SA devotees and said he was deeply impressed with their love, affection, volunteerism and above all disciplined dharmic life. I am happy that you liked the Diwali satsang. May you be endowed with such qualities! The posting reflects the “ethos of attention to detail” of the Sri Ramakrishna family. The digital images truly reflect the devotees aspiration for ernest perfection. I am certain that all the devotees were blessed by Mother Laksmi for the sacrifice and extra-ordinary participation. I have a suggestion Maharaj. Is it possible to project some of the activities from the blog as a powerpoint on 13 November 2010 as a prelude. Generally, the devotees come in early (sometimes 30 minutes before the commencement of the function) and can also have a visual fest. This will also encourage devotees to read the SV blog. To the Estcourt devotees, on behalf of my family, I wish to congratulate the ‘Team Escourt’ for promoting Sri Ramakrishna’s principles. Thanks for your kind words! Yes, the ‘Team Escourt’ did perform exceptionally and I admire at the strength of unity that prevails among the different groups. By coming together their ‘chosen’ deity is not given a ‘go’ but well assimilated in leading a life of dharma. Regarding your suggestion, I will have occasion to definitely consider but, for the day’s function, I am afraid, it is too early to arrive at any conclusion. However my thanks to you for forwarding some good ideas. I always wondered, what is so great (other than a very well designed and presented Blog with your excellently written messages filled with Devotion, Love and Compassion for Devotees!) in VEDANTA IN PRACTICE Blog? Today, for the first time, I think I could get the answer! It is the CATHOLICITY OF THOUGHTS!! As I have understood Thakur’s (in fact Mother and Swamiji also) WAS and IS ONLY INCARNATION WHO CAME ON THIS EARTH ONLY FOR THIS SPECIFIC PURPOSE OF BRINGING HARMONY AMONG RELIGIONS!! And you are ACTUALLY PRACTICING HOLY TRIO’S MESSAGE AMONG PEOPLE OF A DISTANT COUNTRY IN DIFFICULT CONDITIONS! …if there is ever to be a universal religion, it must be one which will have no location in place or time; which will be infinite like the God it will preach, and whose sun will shine upon the followers of Krishna and of Christ, on saints and sinners alike; which will not be Brahminic or Buddhist, Christian or Muslim, but the sum total of all these, and still have infinite space for development; which in its catholicity will embrace in its infinite arms, and find a place for, every human being, from the lowest groveling savage not far removed from the brute, to the highest man towering by the virtues of his head and heart almost above humanity, making society stand in awe of him and doubt his human nature. It will be a religion which will have no place for persecution or intolerance in its polity, which will recognize divinity in every man and woman, and whose whole scope, whose whole force, will be created in aiding humanity to realize its own true, divine nature. Please accept our humble Pranam! The Gods also rejoiced when Revered Swamijee entered the temple hall! Yes! i can still recall the deafening roll of thunder and the blinding flashes of lightening when Revered Maharaj began his discourse. After a minute all was quiet and the soft fall of the rain was most welcome as parts of the country was experiencing a dry spell. Wherever Revered Swamijee went, it seemed that the rains followed and brought immense relief to the land and to the people. There truly was a “Mart of joy” at Estcourt Swami Sahajananda Community Centre hall as the heavens opened in the presence of our Revered Swamijee. Devotees and well wishers left at the end of the inspiring program with a sense of immense peace and pleasure after Swamijee’s illuminating and brilliant talk. First congrats to you for, yours is the One Thousandth comment! I am happy that many devotees are trying to express their responses through this medium. Yes, it is true that whenever rains come down on the parched land, the land becomes greener and the inhabitants become gladder. Wherever I go, I find people are indeed thirsty for knowledge. From the questions they pose during post-supper sittings at every place, I can understand the depth of seeking. The lives and teachings of legendary saints, inspiring revelations of incarnations and the glories of Gods and Goddesses – in short spiritual thoughts alone can quench this thirst. I have no words to praise the organizers of the Estcourt Diwali festival. Kudos to them! May all be happy, healthy and lead a harmonious life! From your mail, I came to know how Sri Ramakrishna’s name is spreading from door to door about which one day Thakur said that he would be worshiped by each and everyone. But Maharajji, when are you coming down to India? so that we can hear more from you. Today is the 2nd day of Jagaddhatri puja (Saptami) so it reminds me much about you and we all are missing you here and remembering golden days in RANCHI. JAI JAGADDHATRI MAI KI JAI ! Thanks for evincing great interest in the developments here in South Africa. Yes, the orbit of Master’s influence is slowly and steadily increasing in its circumference so that more and more people striving for spirituality are brought in. Who can actually decipher His work? There is no date fixed in the near future for going to matribhoomi. Well, it is better to leave that into the hands of Sri Thakur! I am stress free, you see! Oh! you have timely reminded me about Sri Sri Jagaddhatri Puja. What a wonderful time I had for long twelve years in Ranchi Sanatorium! I have never felt exhausted talking about that everywhere! Here of course, such type of puja is not followed. In my weekly Gita class on the next day that is, on the ensuing Tuesday, I shall, if Mother wishes, try to speak about it a little. May Mother Jagaddhatri bring peace and prosperity to you all! Wish to see you in person! Happy to get your letter & Blogs. We will write to you more after Jaggadhatri Puja. Hope to get the blessing of Ma on Puja. I understand you all must be very busy with Sri Jagaddhatri puja. If possible send some snaps by email. Have some close-up pictures of Ma Jagaddhatri. Wish to see me in person? Why don’t you make a trip to Durban? I met you last Saturday in Estcourt and advised that I had a wonderful dream of you. Can you please explain the significance herein. Whilst sitting at your Saturday satsang I was filled with deep spiritual emotion.